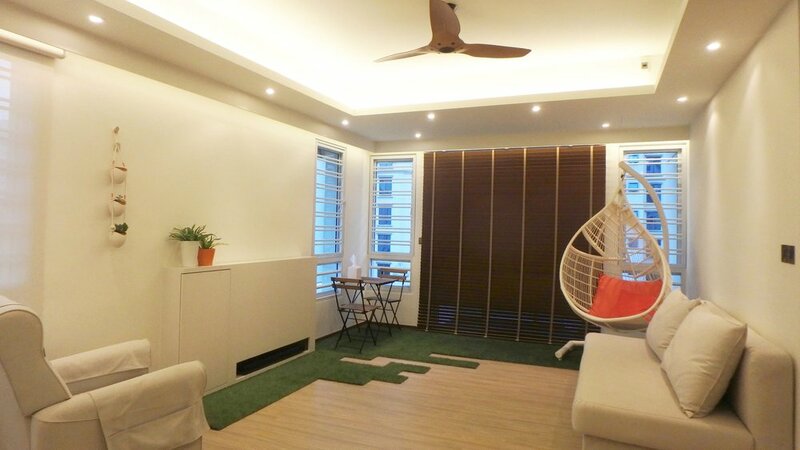 Spacious yet cozy living space for kids to play. 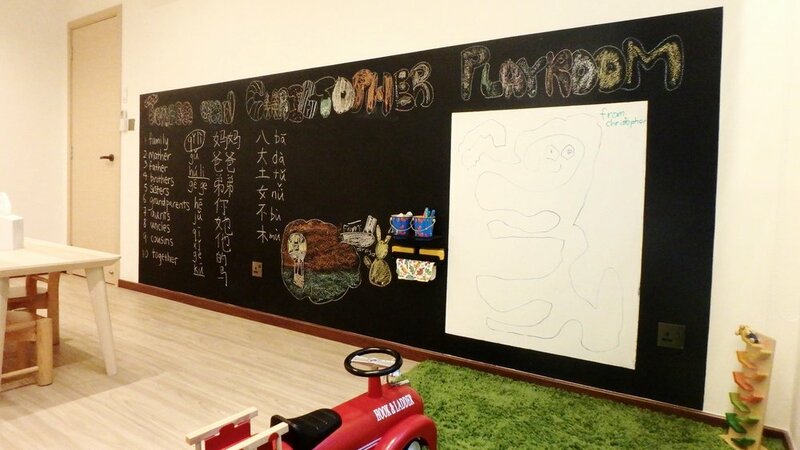 A chalkboard wall for the kids to draw and unleash their creativity. Clean and simple dining set. A living room cabinet that cleverly hides the DB box. A little custom-made door for the kids that connects the bedroom to the playroom. 2-in-1 Dining and Pool Table. An entertaining evening - dinner followed by a game of pool. 2-in-1 Dining and Pool Table. The storage cabinets are positioned such that they do not obstruct the pool cues while playing. The low cabinet also doubles up as seats when a game is in play. 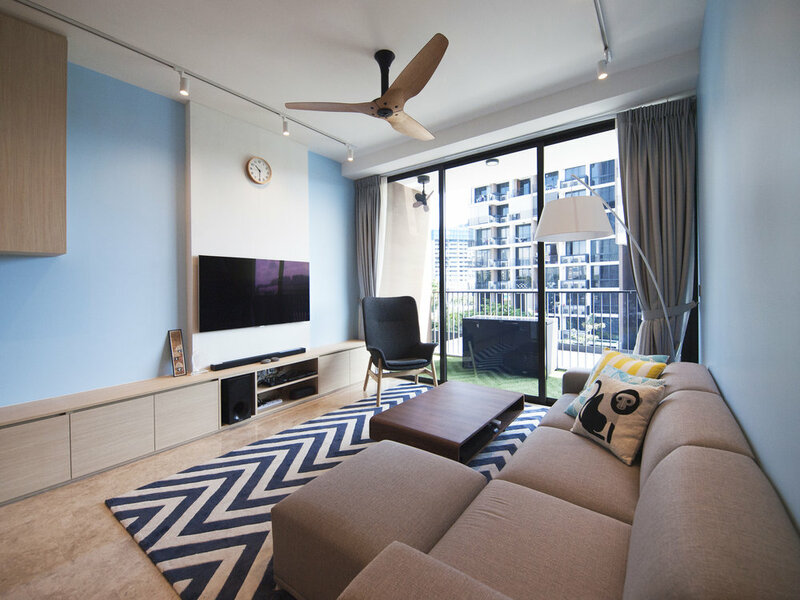 Playful and vibrant living area. Ready to party. Master Bedroom with bespoke lift-storage bed and slim TV console. A comfortable living area to relax after a long day. 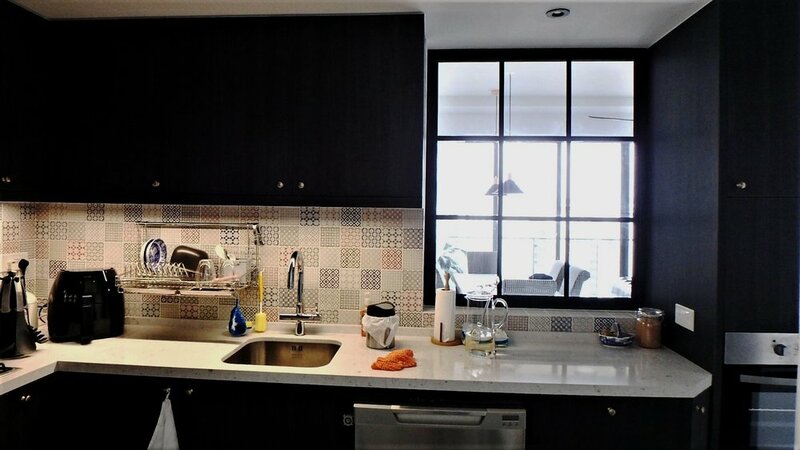 This small transitional kitchen packs a concealed refrigerator, washing machine and microwave! 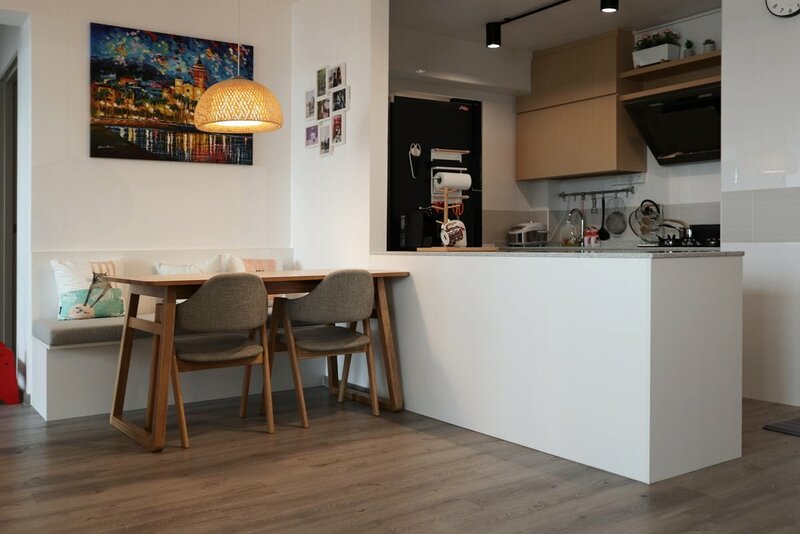 A small but space efficient kitchen. Cosy Study with a view. Sprucing up the bathroom and keeping it in theme just by updating the vanity cabinet. 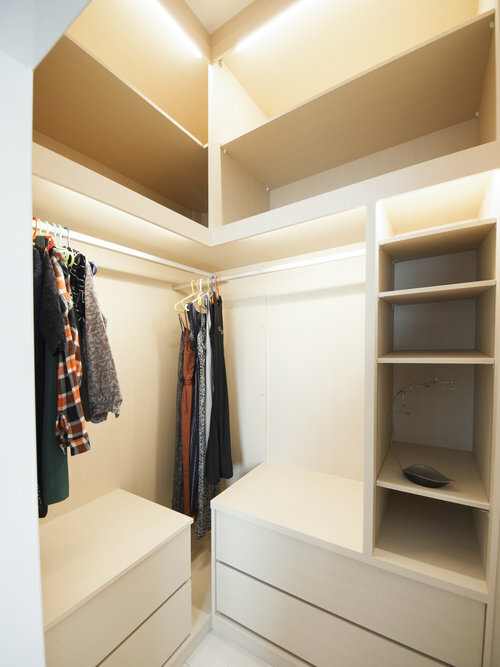 Maximizing wardrobe space in a small area. A transitional colonial home - a mesh between traditional and contemporary furnishings. The wet kitchen was extended out to create a spacious kitchen. A large window allows more natural lighting into the kitchen while enhancing the transitional colonial look. Furnishing and accessories make a transitional colonial home. A large window allows more natural lighting into the kitchen while enhancing the transitional colonial look. Quartz counter top for superior durability. 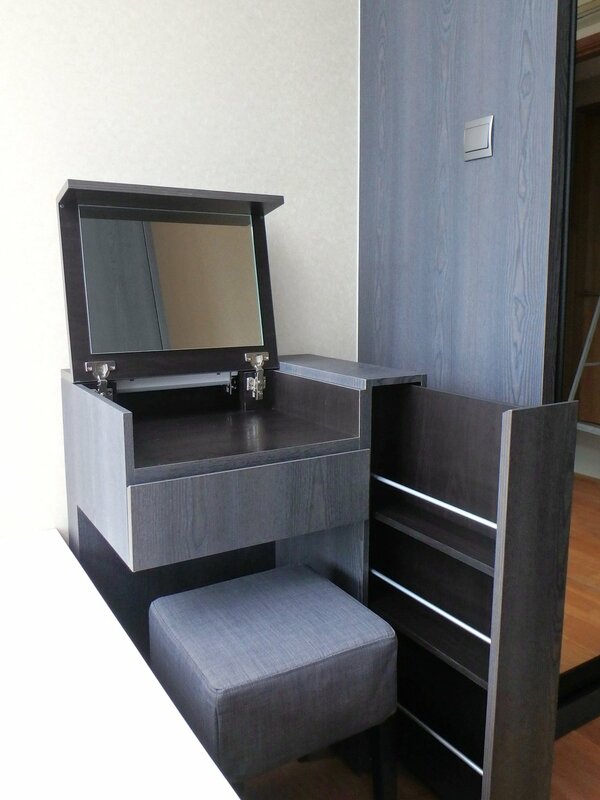 Retractable shelving allowing access to cosmetics and grooming accessories while using the mirror. 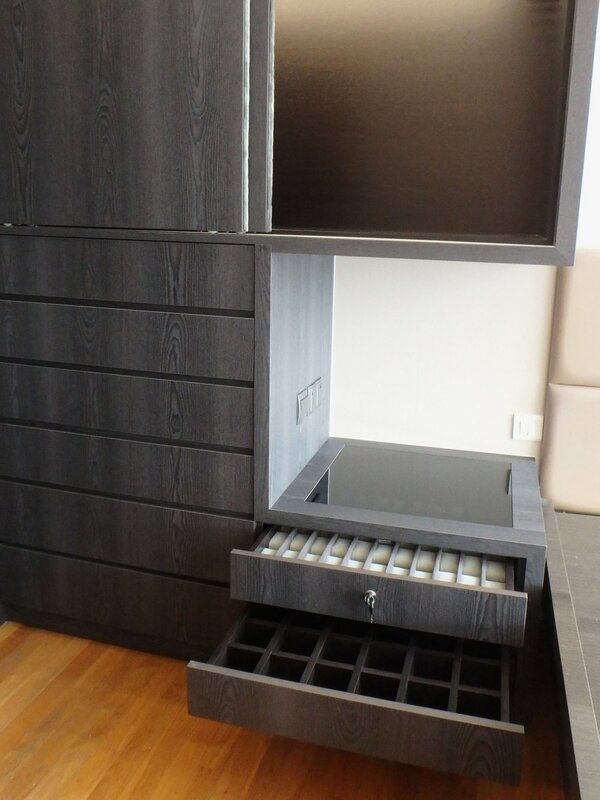 Built-in dresser with retractable wardrobe door featuring a pull-out table top fitted with a mirror. Cosy family area with plenty of storage space. Music studio, study and guest room - all in one! The L-shaped wardrobe maximizes storage and doubles up as a bedside table. Bright and airy Master Bedroom. A balcony you’'ll be enticed to utilize. 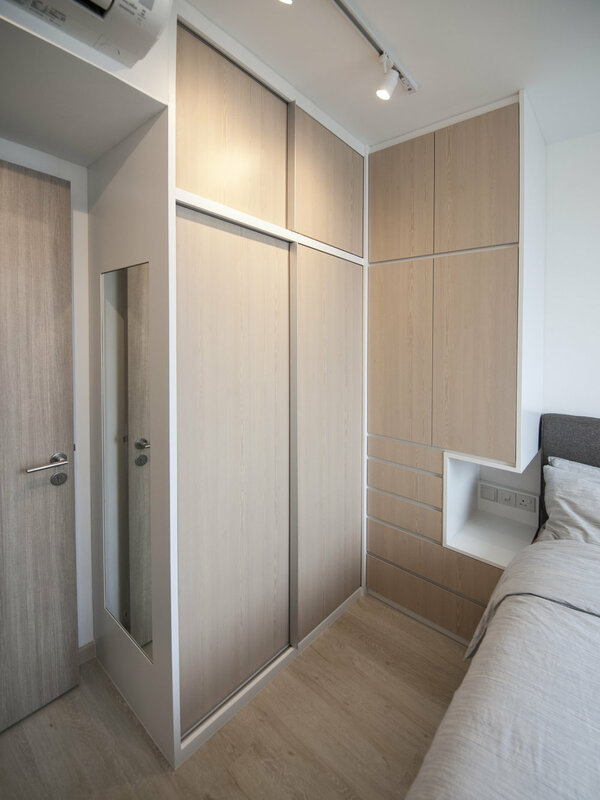 A sliding wardrobe with a concealed pull-out mirror under the ceiling beam. A standing dresser and wardrobe combination. 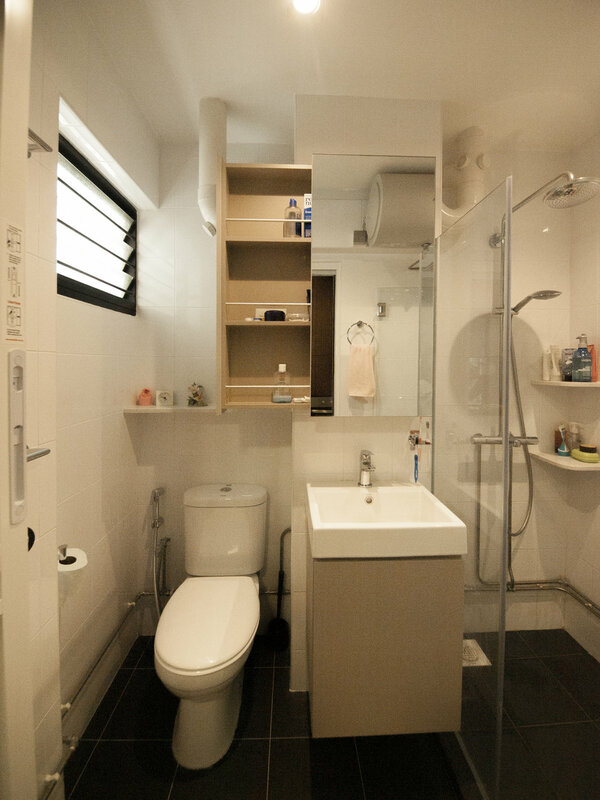 Concealed the floor to ceiling pipes partially to maximise the space and give a clean look. 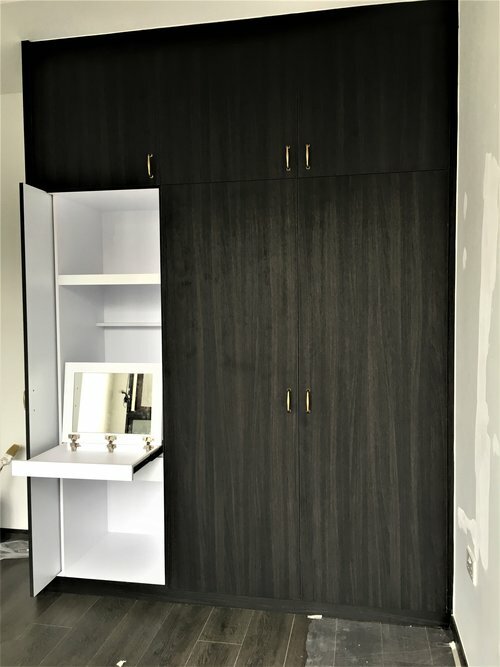 A sliding mirror cabinet allows you to use the mirror while accessing your bathroom essentials! A warm and cozy living space. A large space was originally designated for the DB Box and modem. To optimise the use of space, this was transformed into a shelving cabinet for storage and display, concealing a good amount of electrical trunking and other electrical components while acting as a feature piece. Mirror cabinet in the bathroom. Shoe cabinet and TV console combo. Dining table in a small space for a family of 5. Dresser and TV console in the Master Bedroom. 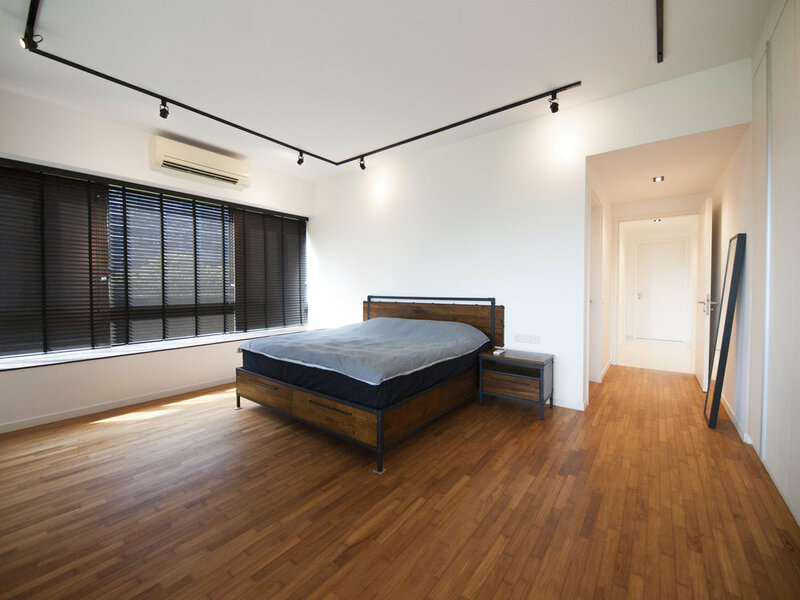 The steel ladder structure serves as an interesting feature and keeps the mirror faced away from the bed. Standing dresser in the Master Bedroom. A living space for the whole family! Open concept kitchen with a dining nook. Shoe & display cabinet with adjustable height shelving to maximise shoe storage. Master Bedroom with a wardrobe, and a dresser next to the windows. Master Bathroom with a fitted bathtub. A spacious family lounge with ample space for their prized collection. The family lounge doubles up as a guest room, with ample wardrobe space for guests. 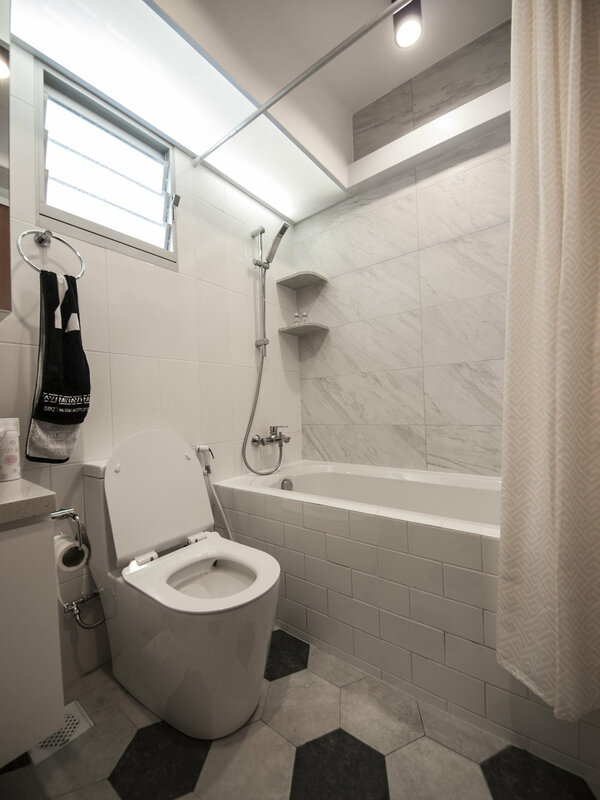 It was a challenge to revamp the kitchen but preserve the original concrete structure for the cabinets and floor and wall tiles. We achieved a brighter, more airy feel for a pleasant cooking experience. 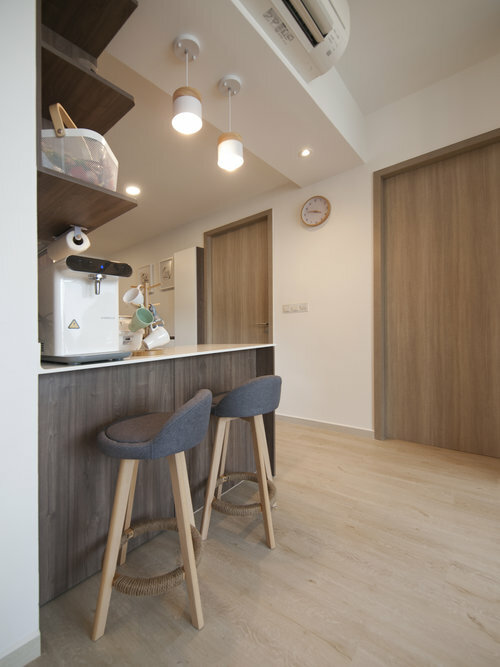 Kitchen with a small dining nook for quick meals. 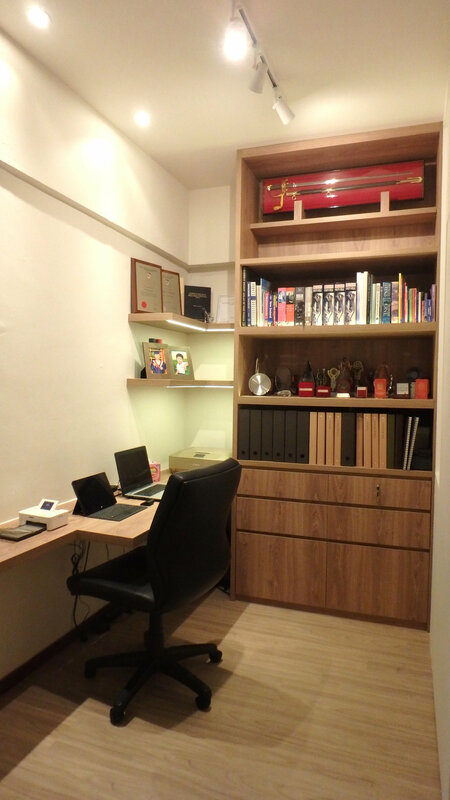 Re-designing 2 bedrooms with ample wardrobe space for HIM and for HER. A nightstand with ample space for a watch collection and accessories. The columns of watch cushions can be easily removed and used for belt/accessories storage instead. Scarves, jewellery, watches - a place for everything and everything in its place. The shelves are height adjustable to suit all size of bags and wristlets. The artificial grass sends out a playful vibe and acts as a huge floor mat, trapping dust as the children wander in and out of the balcony. The TV is neatly concealed using a TV lift system. Clever space planning to convert the small utilities room into a Study with sufficient space for a desktop, printer, display shelves and books of higher learning for the two doctors. A large writing wall to let the little ones' imagination run wild, and at other times, to facilitate learning. Accomplished using chalkboard and whiteboard paint. Wall-mounted holder for writing materials, designed and 3D printed by hungyijaime. An open island which doubles up as a bar! Cosy living space with ample seating and storage. Study corner with a dresser.